Over 700 bridge players came from all over the country to participate in the Sydney Spring Nationals at Canterbury Racecourse which was held from 21st – 29th October. After a series of competitive matches of teams and pairs, the Jacaranda Pairs on the 29th was held in conjunction with the finals of the Women's and Seniors' Teams. More than 20 players showed up in purple and enjoyed a fun game in style. Please find all results, pictures and eBulletin on the Sydney Spring Nationals HERE. 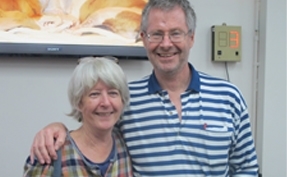 Wollstonecraft Pairs winners – Heather Cusworth and Peter Jeffery. 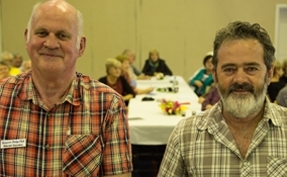 Malcolm Saunders and Ian Price from Armidale won the Tenterfield Swiss Pairs. 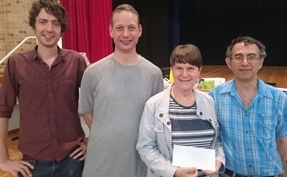 Open Teams winners in the Pennant Hills Congress: John Newman, David Wiltshire, Pauline Gumby and Warren Lazer. Events highlights from 31st October to 6th December. Click HERE to view congresses in the full year. We didn't plan it, but there are always moments that we end up in "crazy" contracts. Rakesh Kumar shared with you his experience of these absurd contracts in recent congresses and how he turned these moments into a happy ending. Read the article of Crazy Contracts by Rakesh Kumar. Have you noticed that there is a new design on the NSWBA website to easily access to Matthew McManus' articles? Matthew McManus has been heavily involved in the Sydney Spring Nationals this month and would like to invite you to try this new page. Click HERE for our current "interim" list, as at 31st August 2015.